WASHINGTON — The White House lacks a unified plan to increase the government’s borrowing cap as a likely September deadline is drawing near, said Mick Mulvaney, director of the Office of Management and Budget. A failure by Congress to raise the debt ceiling could possibly send dangerous shockwaves through the global economy. The federal government could be at risk of defaulting on obligations such as interest payments on bonds as well as temporarily halting benefit programs. 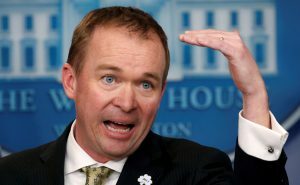 The White House budget director suggested in an interview Thursday with reporters that neither the Trump administration nor Capitol Hill lawmakers have set their terms for an agreement. “It’s fair to say we haven’t settled on a final way to address the debt ceiling any more than the Hill has,” Mulvaney said. Under the current borrowing restrictions, the government has already been taking extraordinary measures and will likely be unable to pay its bills at some point in September. But Congress still has a recess scheduled in August that could create time pressures. Private analysts say the debt ceiling deadline could be extended into October. Mulvaney said he would like to see the debt ceiling raised in July. But Trump administration officials still have yet to resolve internal differences on the best strategy to increase the legal cap on government debt, which already exceeds $19.8 trillion. Under the current borrowing restrictions, the government has already been taking extraordinary measures and will likely be unable to pay its bills at some point in September. Mulvaney suggested that he would like to have any increase in the borrowing authority be attached to other spending changes, a move that could attract Republican support but alienate Senate Democrats. President Donald Trump’s budget proposal seeks to beef up spending on the military and border security while cutting many social programs. Treasury Secretary Steve Mnuchin has indicated that he would like a “clean” bill to raise the debt ceiling, so it would not have to be tied to any spending changes. A 2011 standoff between Republicans and the Obama administration over the debt ceiling led to tighter controls on spending. That standoff was not resolved until the 11th hour and prompted Standard & Poor’s to impose the first-ever downgrade to the country’s credit rating. The administration is also engaged in talks with House and Senate Republican leaders about what kind of increase they could possibly pass. He said the issue was not a source of division inside the White House or the Republican Party. The discussions involve whether the House should increase the debt limit enough to last through the 2018 election or the president’s first term. “It would be foolish of us to come up with a policy devoid of having talked to the Hill,” Mulvaney said. Congress also faces pressure to pass a budget in September for next fiscal year, as well as to address administration priorities that include a tax code rewrite and the proposed repeal of President Barack Obama’s 2010 health insurance law. Failure to pass spending bills could cause a government shutdown and cause non-essential government agencies to close their doors. Trump suggested on Twitter last month that he might welcome a shutdown to help shake up the government. Left: The White House lacks a unified plan to increase the government's borrowing cap as a likely September deadline is drawing near, said Mick Mulvaney, director of the Office of Management and Budget. File photo by REUTERS/Kevin Lamarque.